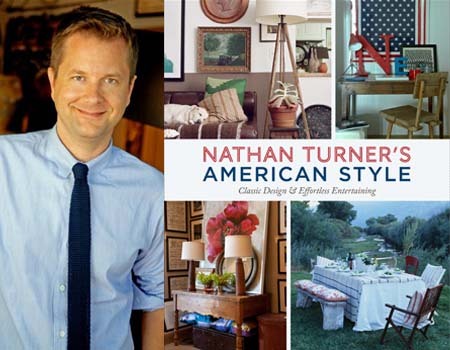 This week on The Skirted Roundtable, we chat with LA based interior designer Nathan Turner. Okay, we actually chatted with him last month, but I had the slows and didn’t get around to editing the podcast till this week – bad blogger, bad! Anyway, Nathan is truly one of the most refreshing and delightful people I’ve spoken with. I interviewed him on ::Surroundings:: last year via podcast (listen here) when he was a regular cast member on Season 1 of Bravo TV’s Million Dollar Decorators. I was disappointed that he was not going to be a regular on Season 2 of the show because he added such a refreshing calm to the proceedings – kind of like a nice palette cleansing sorbet. He still shows up to hang out with his bestie Mary McDonald, so we do get a little of him. On this week’s Skirted Roundtable podcast we asked Nathan why he didn’t return to the show and I loved his honest assessment about his own personality and the value of being on such a show. It’s fascinating, so please, click on over and have a listen!